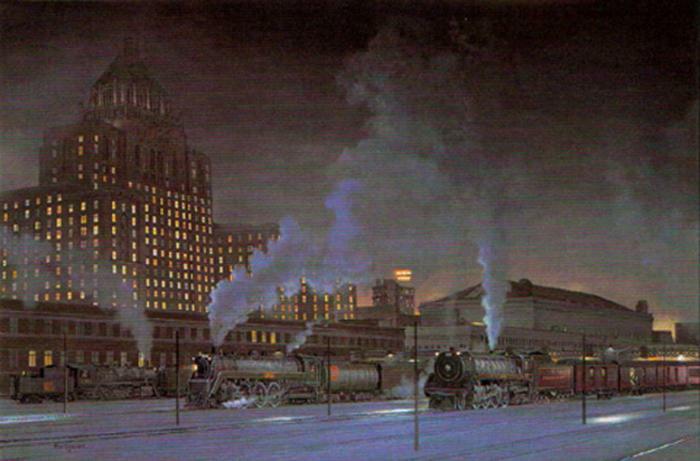 Image Size: 9" x 6" Framed Size: 14" x 11" Once towering over busy waterfront railyards, Toronto's still prestigious Royal York Hotel is now surrounded by a forest of younger and taller buildings. In a scene from an earlier time I wanted to co-feature trains from Canada's two major railways, each drawn by a "Hudson" type locomotive. Canadian National's handsome #5700 was one of only five built for the railway in 1930, while number 2839 is one of Canadian Pacific's "Royal" Hudsons. The Royal designation followed the King and Queen's rail tour of Canada in 1939. Departure times and destinations of these trains are left up to the viewer, as Union Station was a hub of activity during this era of rail travel.